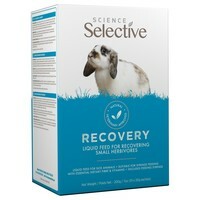 Science Selective Recovery provides the ideal solution for feeding sick or convalescing small herbivores. Designed as a liquid formula for easy administration, Science Selective Recovery is idea for use during times of stress, lack of appetite or digestive sensitivity. It will help stabilise the digestive system and provide nutritional support to vulnerable animals. Science Selective Recovery also helps to restore nutritional wellbeing and when mixed with water it can assist rehydration, and help stimulate natural feeding. Contains no added sugar or artificial colourants. Simply mix 1 x 20g Recovery Plus Sachet with 70ml of warm water. Administer small amounts directly into the mouth using an appropriate oral doser such as a syringe.